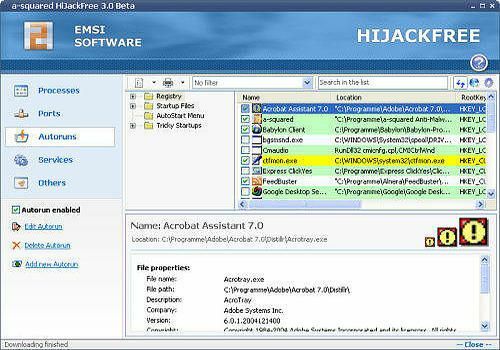 a-squared HiJackFree is a detailed system analysis tool which helps advanced users to detect and remove all types of HiJackers, Spyware, Adware, Trojans and Worms. Manage all types of Autoruns on your system, Explorer and Browser plugins (BHOs, Toolbars, etc.). running Processes and their associated modules, control all Services, even those Windows doesn't display, view open ports and the associated listening processes and edit the hosts file.